Last night, I hosted a Unicorn Sparkle Party. Unicorn Sparkle is a local soap making company started by Christa Price. 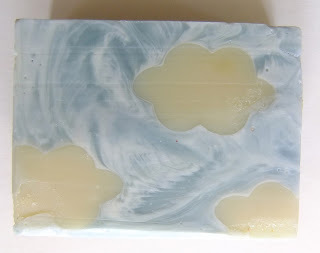 They started with liquid laundry detergent, and have branched into all kinds of wonderful things like shampoo and shaving bars, deodorant, stain stick, lotion, and the most wonderful handmade, chemical-free soaps you can imagine! You can find more info on Christa's facebook site: Unicorn Sparkle on Facebook Why not pop over and give her a "like" if you are on Facebook. Or, on the website: Unicorn Sparkle on the web! Here is a sample of what I got at my party... some of these I purchased, and some of them were towards my hostess credits. Each bar is truly an original piece of artwork. But, artwork that you can USE because Christa keeps coming up with new scents and beautiful soaps, so don't hoard them, use them, and then go get more!!! 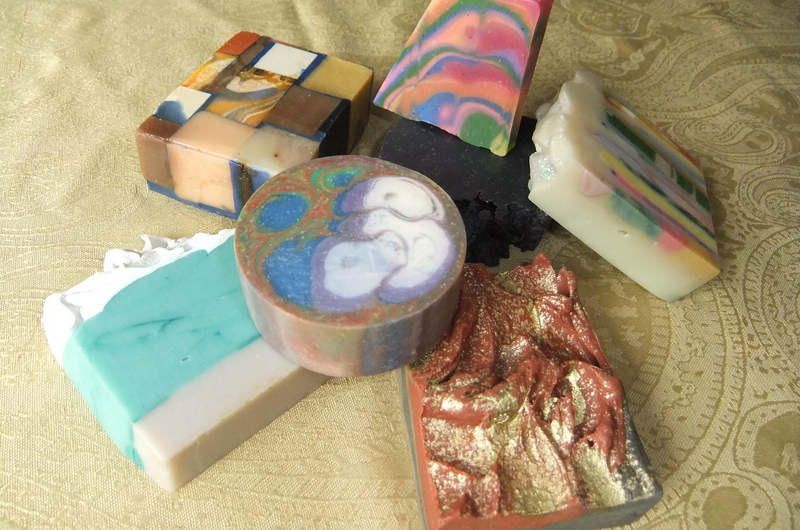 These soaps make such great gifts for teachers, housewarming, hostess, just because, birthday - you name it! There is such a variety with Unicorn Sparkle, that you will literally find something for everyone and anyone you might want to give a little gift to. I also love that these soaps won't break the bank. For the amount of work that obviously goes into these handcrafted soaps, they are very reasonably priced. The cost is only $20.00 for 4 bars. Keep them dry in between uses and they will last a long time. 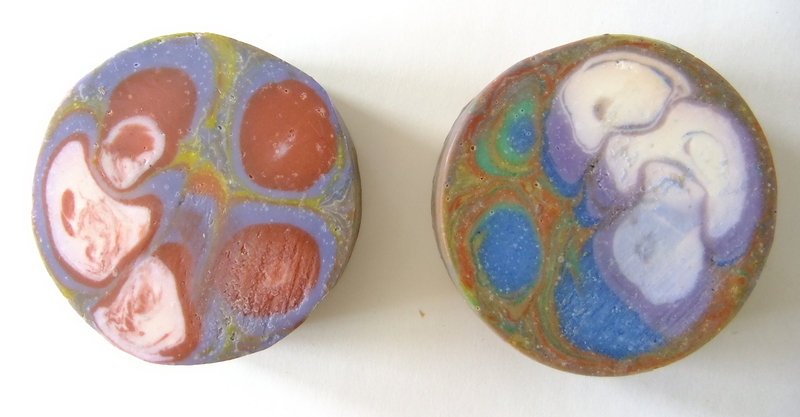 These first 2 pictures are the same bar of soap. There is a rainbow swirl on one side and blue sky and clouds on the other side. 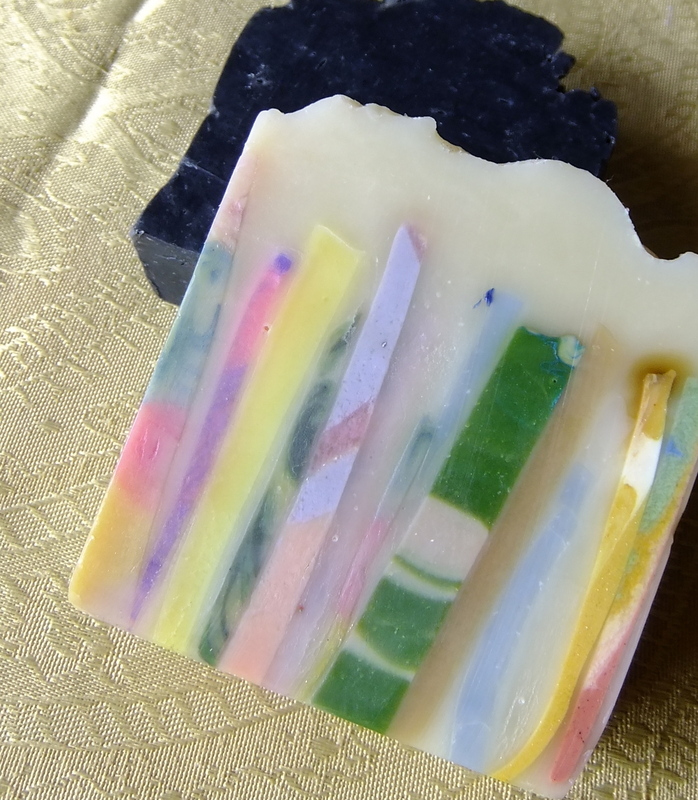 I fell in love with this bar, and it smells delightful! My kids couldn't get enough of this next rainbow bar. 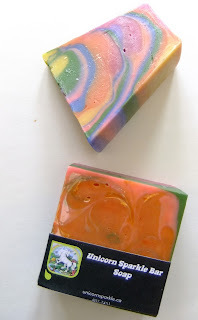 When I woke up this morning, my oldest was walking around holding this wedge soap and smelling it! It's the one he picked for himself. They each got to pick one. These round ones are Energy. They are the ones that Steve (my hubby) loved so much he bought all 3 that Christa had on display last night! Too funny. When he walked in at the end of the party and said, "I like that one" I put one aside to buy for him. Then he came back and said, "I said, I like that one. Buy them all!" haha! So... I bought all 3 of them :) Only 2 are pictured because the other one is already being put to use! 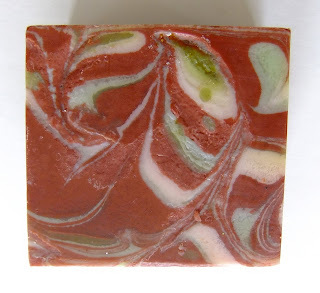 Apple - when you pick up a bar of soap and you feel like you want to bite into it. That is this bar! Such a delicious scent. Ocean Rain. 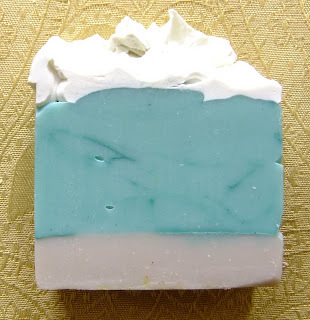 A fresh clean scent, reminiscent of the ocean. I love the picture this bar makes - sand on the bottom, the water in the middle and the frothy waves on the top. Beautiful. Patch. A combination of several of Unicorn Sparkle's soaps. This one is so cool to look at. It will display really nicely, too. Gold Rush. I just love the look of this one. This photo does not do it justice, it is rugged and regal all in the same bar. 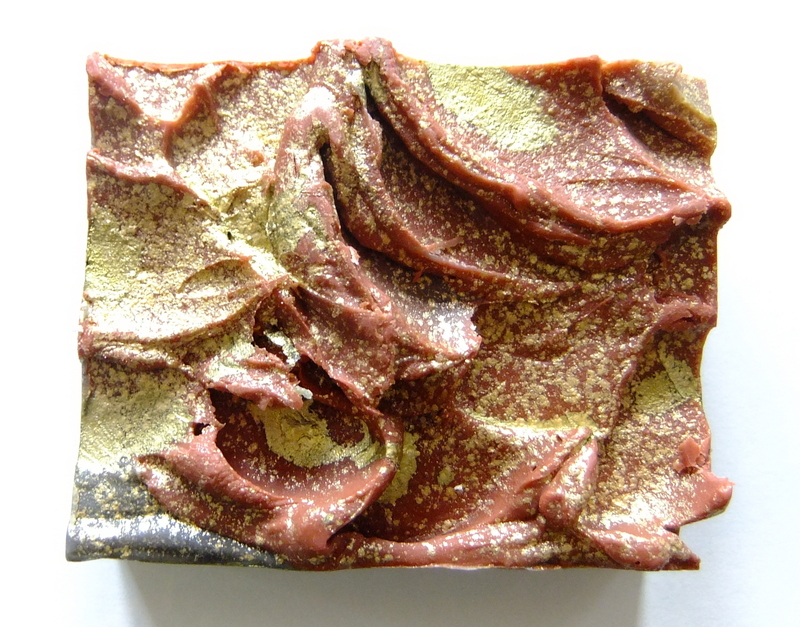 This one I am going to sit and look at for awhile before we dig into it because it looks like real gold! Stripes. Seriously, how cool is this? 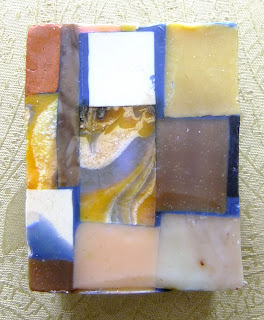 A bunch of different soaps, combined to make this fun and funky pattern. Underneath you can see a bit of the black bar, that is very manly, and called Midnight. A bunch of the favourites all shown together. Have I mentioned how GOOD these smell? Wow. 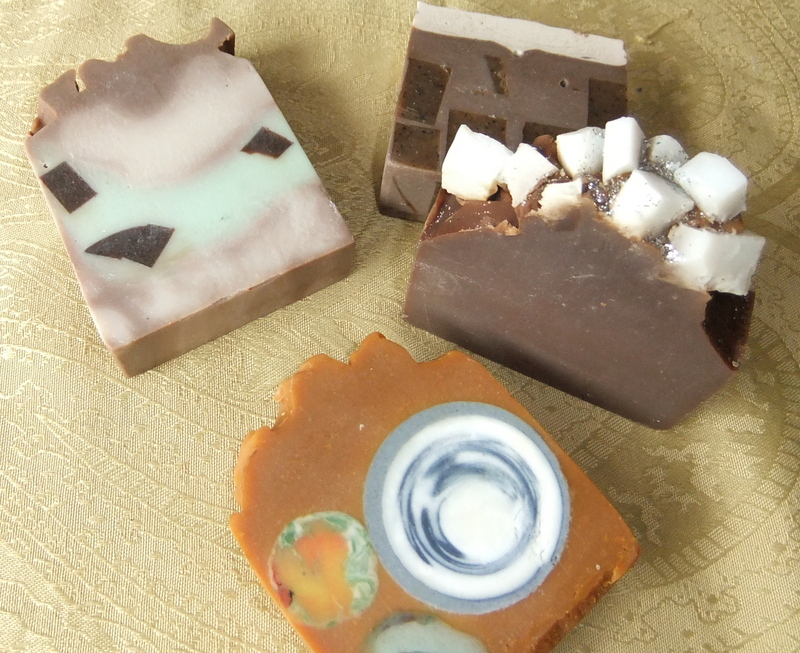 These ones, shown below, all have scents that smell so edible you have to be careful not to mistake them for fudge! Starting from the left, going clockwise, they are Chocolate Chip Mint (an instant favourite of my kids, so we got 2 of these bars! ), Cafe Latte, Hot Cocoa, and Monkey Farts. Yep, Monkey Farts!!! My kids got a pretty big kick out of that one. Can you guess what it smells like? Well, what do monkeys like to eat? Bananas!!! And since Christa knew that this one would appeal to kids, she included a fun bubble pattern in the design. 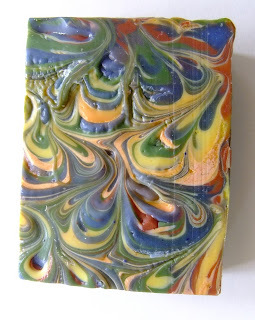 If you want some soap, I really recommend doing a home party. Christa is so easy going and she displays everything so nicely so you and your friends can get a good look before you decide what you want to buy. The laundry detergent is SO worth it... it goes on forever and for a big bucket it is only $20.00 and then refills of the buckets are only $15 - and it has a slight lemony scent that leaves clothes fresh and clean, and it is pleasant to work with, as well).